Regular maintenance fees of $250 to $500 every three to five years is a bargain compared to the cost of repairing or replacing a malfunctioning system, which can cost between $3,000 and $7,000 for a conventional system. Alternative systems can cost even more. The frequency of pumping required for each system depends on how many people live in the home and the size of the system. An unusable septic system or one in disrepair will lower your property value, and potentially can pose a costly legal liability. Household wastewater contains disease causing bacteria and viruses and high levels of nitrogen and phosphorus. If a septic system is well-maintained and working properly, it will remove most of these pollutants. Insufficiently treated sewage from septic systems can cause groundwater contamination, which can spread disease in humans and animals. Improperly treated sewage poses the risk of contaminating nearby surface waters threatening swimmers with various infectious diseases, from eye and ear infections to acute gastrointestinal illness and hepatitis. The average household septic system should be inspected at least every three years by a septic service professional. Household septic tanks are typically pumped every three to five years. Alternative systems with electrical float switches, pumps, or mechanical components should be inspected more often, generally once a year. A service contract is important since alternative systems have mechanized parts. Do minimize amount of household cleaners (bleach, harsh cleaners) and similar toxic substances. Use liquid laundry detergent. 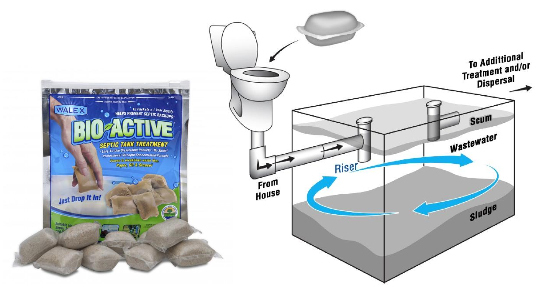 Powered detergents use clay as a carrier and the clay can hasten the buildup of solids in the tank. Become more water efficient by fixing plumbing leaks & consider installing bathroom & kitchen faucet aerators and water efficient products. Check your interceptor rain regularly to ensure that its free flowing. 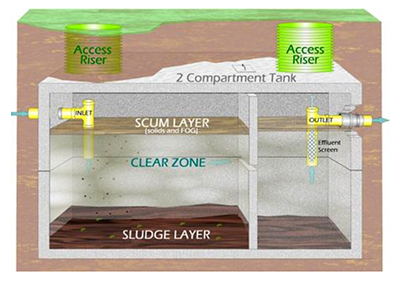 Do make a record of where the key parts of your septic system are located for future pumping service or field repairs. Don’t flush non-degradable products or chemicals, such as feminine hygiene products, diapers, cat litter, paper towels, plastic, paint, dead fish, flammable products and pharmaceuticals. Don’t pour cooking grease or oil down the sink or toilet. Don’t plant trees with large root systems growing near the leach filed. Keep roof drains, sump pumps & other rainwater drainage away from drainfield. Backwash from water softeners contains salt that can damage your leach field. This product is based on select combination of natural soil bacteria in spore form or in stabilized vegetative states. Aerobic as well as anaerobic bacterial species included in the formula to ensure more rapid initial action, as bacteria usually require a few days to activate and adjust to the new environment. Once established, the bacteria will carry out the work effectively to completion. The formula is buffered and fortified with various micronutrients.